Sanderson Trucking Ltd: Servicing Greater Vancouver, Calgary and Edmonton and everywhere in between. Sanderson Trucking Ltd is a specialty trucking and transportation company that handles shipments that most trucking companies simply can’t handle. If you have a shipment that requires special equipment or other considerations that are out of the ordinary, you can count on us to get your shipment delivered on schedule, on time, and undamaged. Sanderson Trucking Ltd is your choice for fast and reliable local delivery in Edmonton. We have provided businesses in our area with all their local delivery needs for many years. We take great pride in our commitment to offering our clients comprehensive pickup and delivery solutions, customized to their exact needs. Sanderson Trucking Ltd’s team of freight trucking management experts are available to recommend cost effective solutions that can help you meet any transport objective. Offering a complete range of flatbeds, stepdecks with ramps and lowbeds for transport services, our reliable fleet can accommodate a full spectrum of transport requirements including tandem, tridem, jeeps and boosters and multi-axle hauls to move a wide variety of equipment, and regular as well as over-dimensional loads. Sanderson Trucking Ltd offers the highest level of customer service and efficiency. On the road 24/7, our trucks are linked to a support service which means that your goods are delivered safely to the right destination and at the right time. In addition, shipments are satellite monitored with convenient and continuous online tracking, as well as proof of delivery notification. 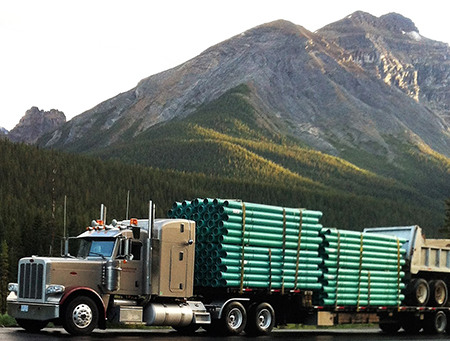 Providing complete freight transport services, Sanderson Trucking Ltd handles every aspect from rigging, to obtaining all requisite clearance permits in accordance with regional regulations. Operating the latest models and top-of-the-line tractors and trailers, our professional team of technical personnel keeps trucks well-maintained and secured with safety features that keep your cargo safe and intact. Enjoy the full advantages of flexible freight trucking services to transport anything from construction and lumber materials, to general commodities and equipment. This is a moving system most people are familiar with. It is often used for shipping and relocating imports or exports and large scale or delicate pieces; machinery and other valuables. Sanderson Trucking Ltd employees are expertly trained in this process so that you won’t have to worry about possible damages or inconsistent arrival and departure times. Maybe you are an in need of proper transport for your newly acquired pieces or a small to large machine or crate. Sanderson Trucking Ltd freight trucking services ensures a safe ride that guarantees your valuables will remain in perfect condition, no matter what the distance.